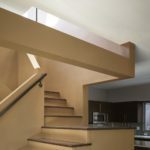 The Brucato house designed by Martin Fenlon Architecture is a rare example of new construction within a Historic Preservation Zone (HPOZ) in the city of Los Angeles. Located in the Highland Park-Garvanza district, which is the largest HPOZ in Los Angeles, the project consists of a new house that replaced the client’s small, aging bungalow. Since the original house was determined to be historically insignificant, its replacement would have to be compatible with the historic context and subject to the HPOZ board’s approval. And with a limited budget, it was critical to reuse certain elements of the structure, such as the existing foundation and parts of the existing framing. This entry was posted in house and tagged bathroom, Brucato House, house idea, houseidea, Martin Fenlon Architecture, myhouseidea, villa on November 4, 2017 by admin.